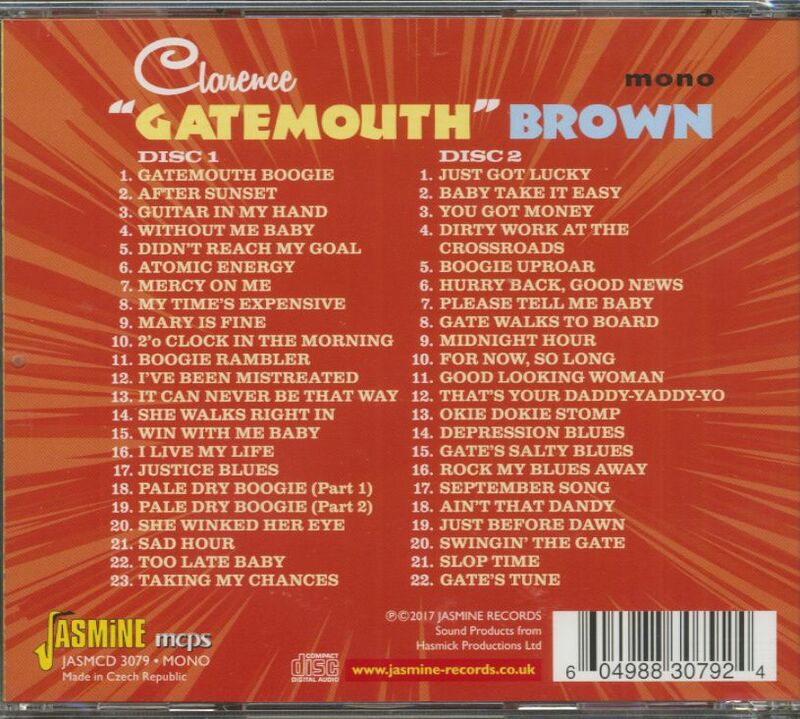 (2017/Jasmine) 45 Tracks - Clarence 'Gatemouth' Brown was more than just a blues musician; throughout his long career he embraced many of the tributaries of American music. As well as being a superb guitarist, influenced heavily, like B. B. King, on the style of T-Bone Walker, he was also a proficient violin, mandolin, fiddle and harmonica player. The 2-CD set features the A and B side of all his releases between 1947 and 1961, and brings together all of his earliest singles for the Peacock label on one collection. Despite receiving very little chart success many of his singles were highly original and are now so famous it becomes difficult to understand why, 'Boogie Uproar' 'Okie Dokie Stomp', 'Gate Walks To Board' and many others were staples for bar bands for years to come and were a huge influence over guitarists like Johnny Winter, Anson Funderburgh and Stevie Ray Vaughan. He didn't like to be called a bluesman but whether he liked it or not he was undeniably a major influence over the genre throughout his lifetime! Copeland wasn't the only Texas blues guitar great undergoing a Rounder recording renaissance. Clarence ‘Gatemouth' Brown had maintained a fairly low profile during the 1960s and ‘70s after cutting some of the most innovative blues platters of the late ‘40s and early ‘50s for Don Robey's Peacock Records in Houston. Now he was back, equally conversant on guitar and fiddle and fiercely opposed to being classified as a bluesman. Country, jazz, calypso, swing—Gate played ‘em all proudly. "I'm a musician. I play it all," said the late Brown. "I hate to be stuck in one bag. I don't ever want to be labeled, and I'm making sure of that!" Another highly versatile guitarist, country picker Roy Clark, got the ball rolling for Gate's big comeback by enlisting him to do a '79 duet album, ‘Makin' Music,' on MCA. "Roy walked in and asked me, ‘Let's do an album!" said Brown. "It was just a jam session, but it was pulled off very well." Gate was on his own at Rounder. Produced by Jim Bateman and Scott Billington at Studio in the Country in Bogalusa, Louisiana, ‘Alright Again!' was Brown's first album for the firm in 1981, cut with his touring rhythm section including pianist Larry Sieberth, bassist Myron Dove, and drummer Lloyd Herrman along with a five-piece horn section. Brown got a trifle funky on his own droll Dollar Got The Blues, Stanton Davis, Jr. stepping up for a two-chorus trumpet solo. Gate's guitar sound had changed dramatically from his blasting early ‘50s attack. He was as fast as ever, but his advanced chops were now being utilized on a Gibson Firebird in an understated, jazzy way that sounded like nobody else. "What I do is play horn lines on whatever instrument I'm playing," he said. "Whatever I'm playing, I try to bend it to the sound of myself. Then I don't use no pick, see. I can control my instrument, rather than the instrument controlling me." Brown always used a capo. "That's my trademark," he said. "That's the way I learned, that's the way I play." Gate made many more discs for Rounder, Alligator, and Verve/Gitanes before he was diagnosed with lung cancer in 2004. Hurricane Katrina interrupted his final days in Slidell, Louisiana, and Brown died in his original hometown of Orange, Texas on September 10, 2005. His artistic scope was truly unmatched. 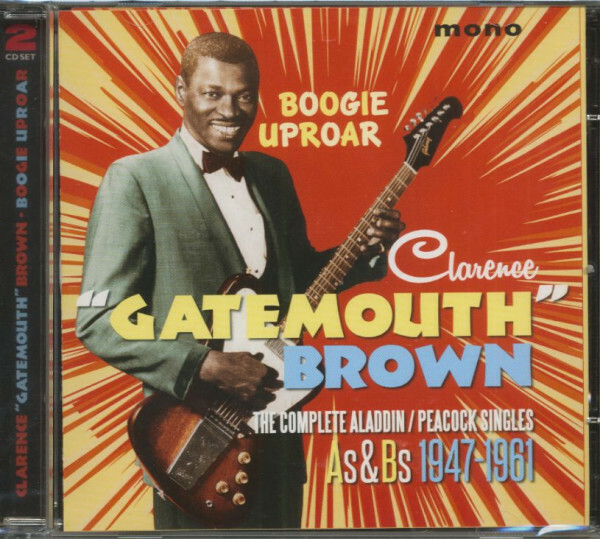 Customer evaluation for "Boogie Uproar - Complete Aladdin/Peacock Singles As & Bs 1947-1961 (2-CD)"